So too, as a matter of fact, was former NAR prime minister Arthur NR Robinson, he noted. Khan also pointed out that a very senior silk, Karl Hudson-Phillips QC, was awarded silk while he was attorney general during the PNM administration in 1971. Hudson-Phillip has called on Archie and Kangaloo to forthwith return their instruments, bestowing the title senior counsel. He said the independence of the Judiciary was totally incompatible with holding a title which required service to the Crown/State/Government. When Robinson and Bernard, not engaged in active practice at the Bar, were awarded silk in 1988, there also was public objection. Robinson, in a letter to the editor in September 1993, defending his acceptance of silk, said he made an application for silk as far back as 1981. He said he personallly delivered the application to the attorney general in the PNM administration at the time. Then attorney general Russell Martineau said he could see no objection, Robinson said. Chief Justice Ivor Archie may not be relinquishing his newly-acquired “Silk” anytime soon and does not intend to make any statement on calls for him and Court of Appeal judge, Justice Wendell Kangaloo to return their instruments of appointment to senior counsel. Astonishing, embarassing. These were some of the words used by former vice-president of the Law Association Hendrickson Seunath SC to describe the acceptance of silk by Chief Justice Ivor Archie and Appeal Court Judge, Justice Wendell Kangaloo, from Attorney General Anand Ramlogan last week. CHIEF Justice Ivor Archie and Court of Appeal Judge Wendell Kangaloo continue to face mounting pressure following their decision to accept appointments to the rank of Senior Counsel while serving as members of the Judiciary. Chief Justice Ivor Archie and Court of Appeal Judge Wendell Kangaloo have driven a donkey cart through the separation of powers, says Senior Counsel Martin Daly. The practice of awarding silk is one of several legal traditions inherited from Trinidad and Tobago’s British Colonial past. In the United Kingdom Queen’s Counsel are appointed by patent to be one of Her Majesty’s counsel learned in the law. Tuesday’s call by former Attorney General, Karl Hudson-Phillips, QC, one of the Commonwealth Caribbean’s eminent jurists, for Chief Justice Ivor Archie and Appeal Court Judge, Justice Wendell Kangaloo, who recently accepted “Silk” to return their instruments forthwith has as its main plank the principle of the Separation of Powers. A CASE OF POLITICAL AMNESIA? Only three lawyers have been appointed as Prime Minister in our short political history: ANR Robinson, Basdeo Panday and Kamla Persad-Bissessar. Two out of the three have “taken silk”. The complaints of political bias or a questionable selection process were never raised by any of the senior silks who gave Mr. Robinson’s appointment a silent stamp of approval. Indeed, my learned friend Karl Hudson Phillips Q.C. was a major political figure in the NAR at the time ANR Robinson took silk in 1988. Silk was also conferred by the NAR regime on a sitting Chief Justice Clinton Bernard. Karl was the political leader of the ONR which was a main component of the NAR. There is no record of any objection on the grounds now put forward. The process, offices involved and circumstances were identical. Are we to assume that it was correct then but wrong now? Were these principles, considered so sacrosanct dormant then. At the time CJ Bernard was appointed Senior Counsel on the advice of Prime Minister Robinson, the President of the Law Association at the time was none other than Michael de La Bastide (President of the Law Association from 1987-1990). As President of the Bar , he would have no doubt been consulted on Mr. Bernard’s appointment as SC. Like Karl, there is no evidence of any objection from him then. I have searched the newspaper records to get a copy of the picture of Mr De La Bastide and Hudson Phillips marching around the Hall of Justice or fasting outside President’s House to register their objection to what they now say was the creation of a bad precedent. Interestingly, I have found none. It would also appear that Martin Daly SC, somehow missed the donkey cart that was being driven through the judiciary then. The time for vociferous objection would have no doubt been then, when this terrible precedent was being set, in the knowledge that once it was set, it could be followed in the future. Persad-Bissessar, like Robinson, enjoyed an active law practice. She has been an Attorney-at-Law for 24 years and, (unlike many of the silks who are presently complaining) represented the poor and dispossessed. Whilst in Opposition, she sued the State in several matters challenging the Caribbean Court of Justice, the non-appointment of the Criminal Injuries Compensation Board, the DPP over his failure to prefer criminal charges against Dr Rowley over the tea cup incident, land matters, election petition cases (both here and in St. Kitts). She also advised on several constitutional matters relating to Mr Panday’s cases and his suspension from Parliament. Persad-Bissessar is also a former Attorney General. In many countries in the Commonwealth, she would have been entitled to take silk ex officio on this basis alone. In Jamaica and Barbados, for example, Attorneys General have routinely been appointed silk as titular head of the Bar. Her contribution to the development of the law in her capacities as AG and Minister of Legal Affairs is significant and was referred to by President in his introductory remarks at the ceremony last week. If the then President of the Law Association De La Bastide, and eminent silk such as Karl Hudson Phillips and Martin Daly voiced no alarm or objection why is the government and certain recipients of the silk now subjected to such intense criticism? It is noteworthy that many of the Senior Counsel that are now objecting and complaining about the system are past Presidents of the Law Association (De La Bastide, Daly, Hudson Phillips). One is left to wonder why they did not seek to change the system during their tenure. And if they accepted the system then, why has it suddenly become so unacceptable and bad? The system for the appointment of silk has not changed much since Independence. There is a lot of obscurity about the award of silk and what is considered “established practice”. A good illustration of this is the fact that Mr. Hudson Phillips’ said judges who were silked prior to their appointment to judicial office should promptly return same upon appointment. There is no record of any judge (including Mr. De Labastide) ever doing this. There is a clear need for review of the system but the idea that the CJ did something wrong in accepting silk as an Honour is blatently absurd in the light of the clear precedent set. The idea that the appointment of judges as Senior Counsel could compromise their independence and breaches the doctrine of Separation of Powers is absurd. Some have suggested that national awards might be more appropriate. Are national awards not also based on the ultimate advice and recommendations of the Prime Minister? Would that not be subjected to similar criticism? Judges would be accepting awards from the Executive that are in the prerogative of the Office of the Prime Minister. It might be said they could be awarded honorary silk. But what would that achieve? It would be an honour without practical effect. It would be subject to the same objection as a national award. Individual independence and integrity of judges are not compromised by the conferring of an award or honour by the Executive arm of the State. This has long been recognized in our system by virtue of the conferring of national awards to sitting judges (for example, Justice Ibrahim and CJ Sharma). Likewise, in the UK, the Crown routinely confers titles and awards on sitting judges. 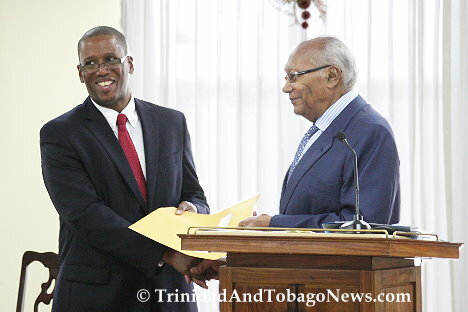 Mr. Karl Hudson Phillips was the first AG to confer silk on himself in 1970 after a mere 10 years at the Bar (He has less than 5 years’ experience at the Bar prior to his appointment as AG). Subsequently, Ramesh Lawrence Maharaj and John Jeremie took silk. There was no objection then. Anand Ramlogan has, during his 15 years at the Bar and represented the poor and downtrodden at all levels. He has been involved in 45 cases at the Privy Council – a record surpassed only by Sir Fenton Ramsahoye QC. He has been an Advocate in many landmark and historic cases and the only explanation for the failure to appoint him as Senior Counsel before is that fact that most of his cases were against the PNM administration.- not even his relative youth ! If the records are correct Daly sought and took silk in his thirties! The Guardian Newspaper editorial (January 5) called upon the present Prime Minister and AG to return their Instruments. This would “demonstrate that they prefer to seek silk only via the dignity of the distance from influential public office, rather than risk the reputation of being self-serving while in a position of power”. Curiously, this call was limited to Mrs. Persad-Bissessar and Mr. Ramlogan. In as much as ANR Robinson, Karl Hudson Philips, Ramesh Lawrence Maharaj and John Jeremie benefited under the same system and attained silk in identical circumstances, why was the call limited to the present PM and AG? The argument that Senior Counsel is reserved for Advocates who have demonstrated excellence and distinguished themselves at the Bar is specious and disingenuous. Unlike England we have a fused profession in Trinidad and Tobago. This means that there are no Barristers or Solicitors. There are only Attorneys-at-Law who can function and perform both roles. This major difference merited a different approach in our country. Hence the reason Gerald Furness Smith, who was not a Counsel, but a Solicitor was appointed SC some 25 years ago. Likewise, Mr. John Jeremie, a university lecturer and non-Advocate, took silk without any objection. The appointment of Senior Counsel has therefore been expanded and developed to meet our unique socio-legal realities. Important law office holders such as the DPP, the Solicitor General and the Chief Parliamentary Counsel have been appointed in recognition positions they occupy in the legal apparatus of the State. The Chief Parliamentary Counsel may not go to the Court but his or her contribution to the law is an invaluable one deserving of the status of SC. The offices of Chief Justice and Judge also fall into this category. The appointment of silk is an honour befitting the office in light of the contribution of the office holder to the law. In England, the Crown also confers titles and honours on judges. These persons perform at the heart of the administration of justice. High Court Judges are made Knights or Dames. Lord and Lady Justices of Appeal are created Privy Counsellors. There is therefore no basis or rationale for the arrogant and elitist demand by some that one Honourable Chief Justice and Mr. Justice Kangaloo return their instruments. As the Chief Justice and most senior judge in the Court of Appeal they have made sterling contributions to the development of the law and their appointments are justified. Prime Minister Persad-Bissessar made it quite clear that this administration intends to break with tradition. We cannot, on the one hand, call for the abolition of the Privy Council and its replacement with the CCJ but cling to English traditions and customs that are of no relevance to our society and legal profession. In England it is the tradition that judges are prohibited from returning to the Bar. There is no reason to impose such a restriction on our judges. Judges, like senior lawyers in public service, may wish to practise law after retirement from office. They must be entitled to do so already equipped with the appropriate accolade of silk when their abilities and experience justify that award. There are many non-Advocate Attorneys who contribute significantly to the legal profession and the development of the law. High office holders in the Public Service and the Judiciary are some. Legal academics, legal aid lawyers and in-house Attorneys who have distinguished themselves by their scholarship and record of commitment and service should also be considered. The present spate of objections therefore seems to be the result of a case of convenient political amnesia. .
Perhaps the time has come for society to ask these SCs who are practising at the Bar to “give back” to the community.and the Law Association should be encouraged to suggest mechanisms and programmes as to how this could be done. The law, and society, is in a constant state of evolution. The law historically has fused tradition with innovation. The appointment of silk cannot remain shackeled to our colonial past- a past which Britain itself has outgrown. To cease to change is to cease to grow. Isn’t it time we grew up and stop being so petty? Chief Justice Ivor Archie bowed to pressure brought by the Judiciary’s most distunguised heads — among them former attorney general Karl Hudson-Philips and former chief justice Michael de la Bastice — and returned the instrument which granted him Senior Counsel status to President George Maxwell Richards yesterday. WORKS and Infrastructure Minister Jack Warner yesterday declared there was no reason why Prime Minister Kamla Persad-Bissessar was not worthy of the title of senior counsel. Neither the Law Association nor its president, Dana Seetahal, was consulted during the screening of candidates who applied for silk. Attorney Surendranath Capildeo, one of the legal minds who received instruments granting them Senior Counsel status on December 30, said yesterday calls of political interference in the decision of who should receive ‘silk’ were “petty”, as the precedent had already been set. Attorney General Anand Ramlogan must come clean and reveal the criteria he used for the selection of attorneys to be elevated to Senior Counsel status or demit office. FRIDAY’S DECISION by Chief Justice Ivor Archie and Court of Appeal judge, Justice Wendell Kangaloo to return the instruments granting them the title of Senior Counsel, or “Silk”, to President George Maxwell Richards is to be applauded. Returning the Senior Counsel’s “silk” he had received one week before, on December 30, Chief Justice Ivor Archie’s stated aim was to defuse “heightening controversy”. He maintained, however, that he had done no wrong by having accepted it in the first place.